There was an increasing air of disillusionment around Villa Park before the game and Villa fans for the first time this season voted with their feet. Empty seats were seen around the ground as the attendance just scraped over the 30,000 mark (30,303). Then, there was an air of inevitability about January Villa target Wes Hoolahan opening the scoring in the third minute for Norwich. Could things get any worse? Well, luckily, no. Inspired by Christian Benteke, out of nowhere, Villa suddenly netted four goals in 15 minutes. Game, set and match. 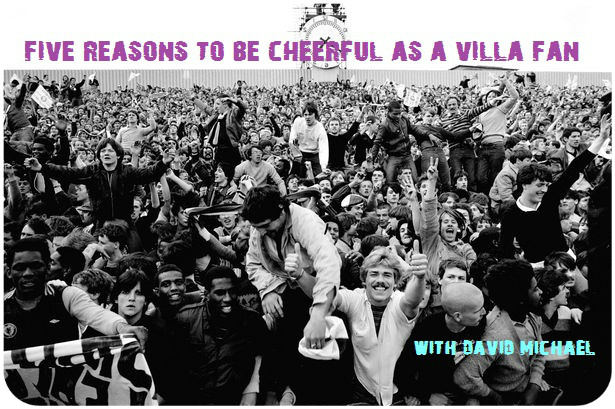 Plus, plenty of reasons for Villa fans to be cheerful about. 1. Villa’s match winner is back. Villa hadn’t scored for 326 minutes and were two minutes away from topping the length of their previous goal drought earlier in the season, when Benteke did a bit of bicycle kick magic. He tried it in the Newcastle game, if I remember correctly, but this time got his eye in. Obviously, Deadly Doug must have given him a few pointers earlier in the week to improve his technique. The Belgian, bagging a second goal a couple of minutes later, flipped the game on its head and showed us the difference he makes to Villa when he’s on song. A bit of trivia – Benteke has scored five headed goals this season, which is the most in the Premier League. 2. When Leandro Bacuna scores at Villa Park, Villa win. It’s seems to be the only time they win too. Four Bacuna home goals this season, a total of four Villa homes wins this season. I’d be tempted to play the Dutchman up front alongside Benteke! 3. Let me state the blooming obvious, that was an important win. For supporters, the club and Paul Lambert. Now Villa are on 31 points with 10 games left to get three wins to reach the safety mark of 40 points. Some points in the next two games, also at Villa Park, should see us comfortable. 4. Speaking of which…Jose Mourinho has never won at Villa Park. If that stat stays the same after Chelsea visit in two weeks time, then they’ll be no reason why Villa can’t see out the season with an unbeaten run at Villa Park. It will go some way to paying back season ticket holders, who have had to endure some shocking displays this season at the church of football. i have to agree with trever – for all our wishing and wanting to buy what we believe we should have – its the player who has the last word. However i thing the young ones will want to come here as we are a club that will play them – they will still only see it as a stepping stone though into the bigger clubs. which odoes mean for us if we have them the inconsistency we have shown all season. when we are goog we are good and when we are bad – well enough said on that. we have no intermediate where grinding out a result when you are playing poorly. Benteke and Bacuna were excellent, though Bacuna is not a right back. Luckily Norwich did not have a left winger. But after the first 20 minutes when this was like watching men on death row, the Benteke show began. WHen he plays like this he is unplayable. THe five months of last season he was the third highest scorer in Europe after Messi and Ronaldo and when on song… I have been going to see Villa since 1958, I venerate the great forwards I have seen, MacParland, |Andy Gray, Peter Withe and plenty more almost as good. But this guy when on song is better than all of them. And his effect on the team is amazing. Once he cut loose, even Karim El Ahmadi, not my favourite player, started tackling back and passing accurately. However Norwich were just dreadful, so perhaps like a shark he could sense blood in the air. Whatever, it was a joy to see him back on form, and while I still don’t see how Lambert can play him Gabby and ANdi in a starting line up, there is no width…. when he conjures something out of nothing as he did for the first goal, it doesn’t seem to matter. I truly believe Benteke is a world class talent and don’t quite believe why Villa didn’t move heaven and high water to bring in a midfielder or two, who had a bit of attacking guile, to bring the best out of him. Benteke has good touch and vision too and we could be opening up teams with interplay around the box, rather than just relying on his muscle off the hoof. It would have given the team extra dimension and make us less predictable. I’ve always said, if you have him in your team, you have a chance against anybody, and he’s been the difference from the drop for both the seasons he’s been at the club. He is exactly the kind of talent we need to have a crack further up the league. If Villa manage to keep him in the summer, they better seize the moment accordingly in the next transfer window. Whether Christian stays will depend on his future after the world cup – if he goes – Lukaku also scored this weekend. If we can’t offer champion’s league football and we won’t this season, then who we sign is irrelevant. If he goes to the world cup, succeeds and we are offered £50k from one of the big boys, we can do nothing. But if he stays, then yes we have to look to better service. But the top midfielders…. they cost. And would they come to Villa? We don’t choose players. We did have a chance to sign a quality midfielder in the summer. Gareth Barry, but though he was happy to come back Villa would not pay £50k per week for a 30 year old. Everton did.